One of the main hair styling tools for women is the hair dryer. But in some cases it has been noticed as a major cause in hair damage, because of lack of knowledge and its improper use specially when using hair dryer for stlying. 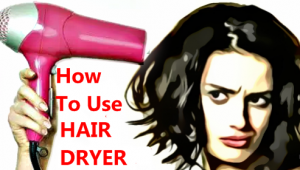 In the following article we have explained how to use hair dryer by yourself at home, without damaging hairs like a professional. You should ensure these two elements must be present when choosing the right hair dryer. It is necessary for a hair dryer to heat well with a good power, so that it can shorten the drying time. But also keep in mind that very excessive temperature can also be harmful to the hair. Therefore, the ideal is to have a heat control feature, so that different temperatures can be chosen according to your hair type. These days we are fortunate to have technologies that protect our hair and also helps to make them look more beautiful after drying. Hair dryers now come mostly with ion technology, which takes care of the hair during drying and also avoids static. If you can, opt for these some of the best hair dryers that bring ion system. As this technology will make your hair look much better after drying and you will also be taking care of it. Although with the latest generation of blow dryers, the damage is reduced enough, anyway the hair is always resentful with the use of the hair dryer. Therefore, it is necessary to know how use it well. For example, do not dry your hair immediately after showering, when it is still very wet. Dry it first with a towel and try to minimise humidity. Then finish with the dryer. In this way you avoid having to occupy the dryer for so long. The maximum drying time of the hair should not be more than 15 minutes, neither so quickly as it can burn and make damage to hairs. In the same way, avoid getting too close, the proper distance is at least 15 centimeters. Btw, it is recommended not to try to use hair dryer for curls and to straight hairs. As it can be risky especially if you dont have much experience. Better to use hot rollers or curling irons for curls, and flat iron for hair straightening purpose. They are available in reasonable prices and its doesn’t look worthy to take risk on beautiful and healthy hairs by trying hair styling using hair dryers only.